I really had nothing to post about this week until I went for an early morning walk this morning. It was beautiful and well worth the effort. Once again - I walked along the Mullens foreshore. 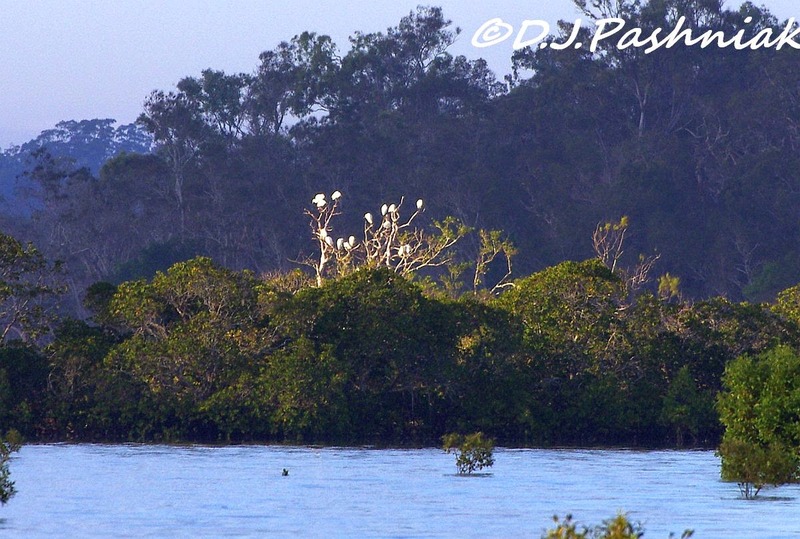 and a whole tree full of Little Egrets in the distance. Of course, there was always my Stumpy-tailed Blue Healer - Misty - to try and coax into a photo! Then just as I was close to the car park this beautiful little bird flew down not far ahead of me. My hand was shaking - I forgot to change the camera settings to compensate for the low light - and the resulting photos are not as sharp as I could wish! 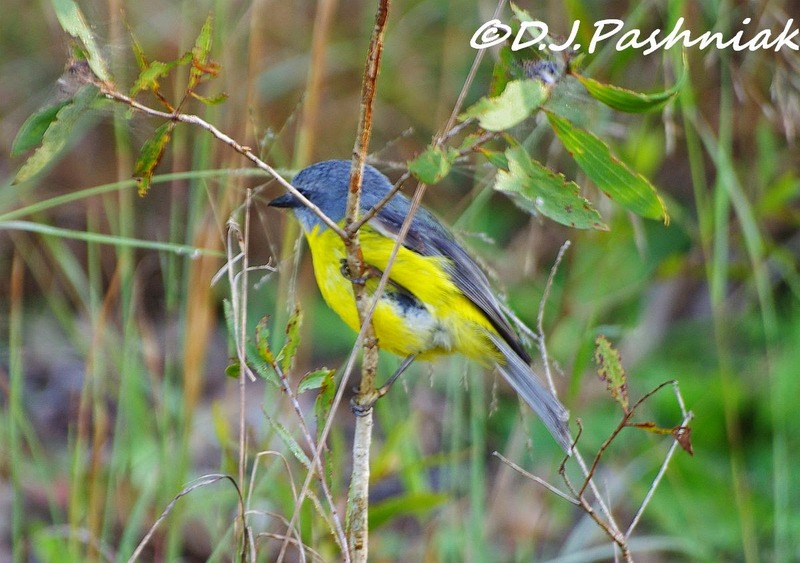 But - an Eastern Yellow Robin is always beautiful! the robin is adorable! so is misty. 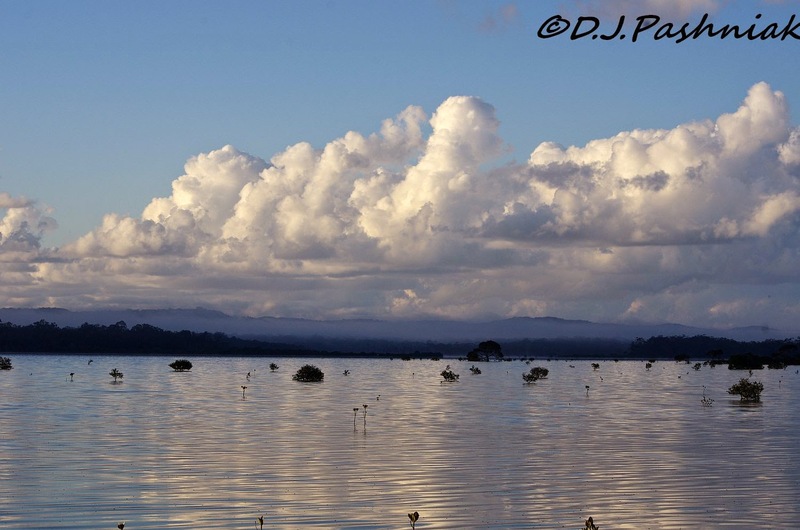 :) loved the silvery reflections! Love the reflection scenes, and of course Misty!! Boom, Bobbi and Gary. What a beautiful walk you had!! Thank you for sharing the beauty, Mick!! I, too, love Misty and the robin!! We never know how much there is to see if we don't get out -- I've finally learned that!! Have a great week!! Beautiful photos Mick, the eastern blue robin is pretty and so is Misty. Wow -- what a gorgeous walk! What a wonderful morning walk with you dog. Though we don't get them here, I love the Eastern Robins. Used to enjoy them in the Victorian high country. Thats the kind of "nothing" I could get used to! That early morning light is just beautiful and always the best for photography. Well worth leaving your bed early, especially with the Eastern Robin bonus. Beautiful photos of the clouds, and those birds are an amazing color. Lovely views from your early am stroll and definitely more inspiring than my damp woodland walk today. Looks like you had a great walk and the robin is very pretty. Glorious water and sky shots Mick! What a sweet little robin, such lovely colours. I know what you mean about shaking with excitement, I was all shakes last week when I spotted and photographed my first orioles. Misty is a sweetie! 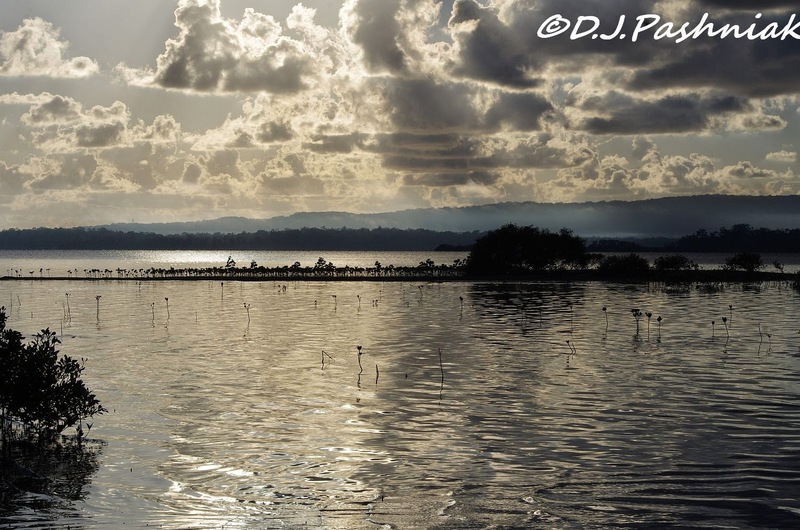 Lovely waterscapes and sky captures.. And the little Yellow Robin is adorable.. Great shots! The yellow robin is darling (and a new -- even virtually-- bird for me). Your water pictures are so restful and lovely -- If I were you I would never think I didn't have anything to post. Misty looks a little peeved that you made her stop walking and turn around for a picture op! 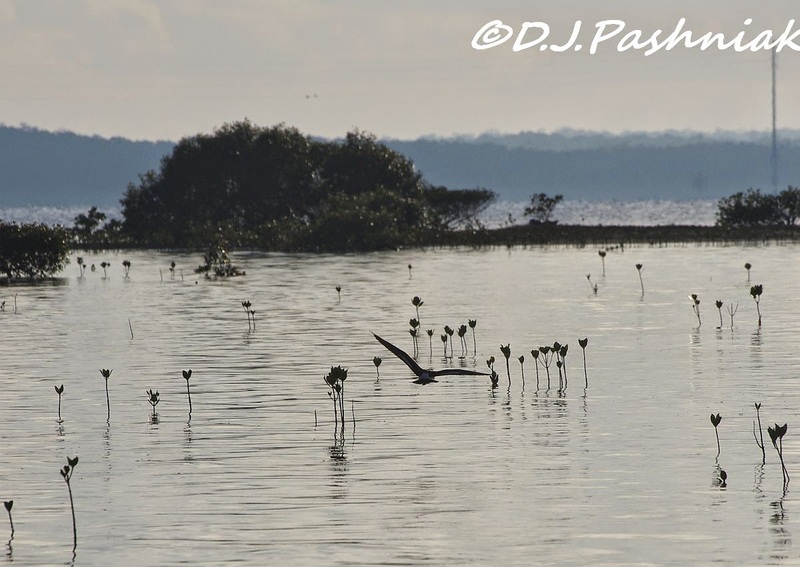 I love your moody scenic shot adn that was a great bonus seeing the Robin, a beautiful little bird. 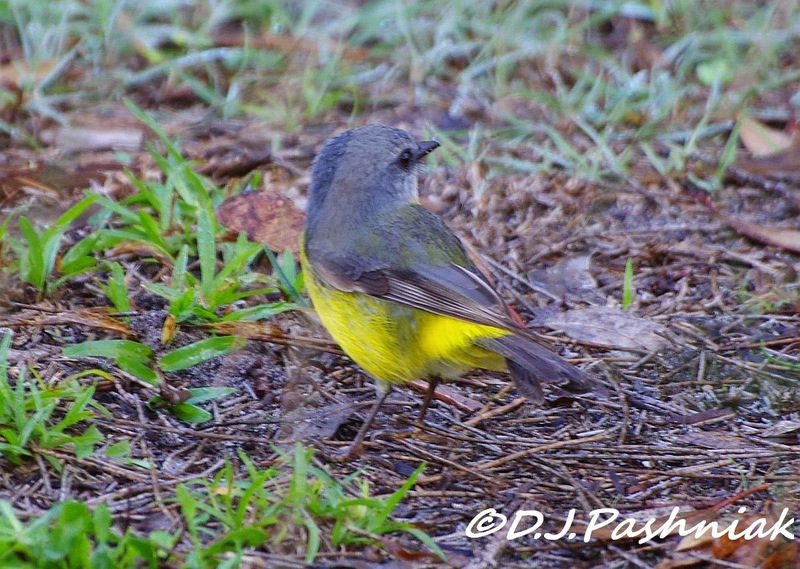 Those northern yellow robins always seem to have a lot more yellow than our's down here! Thanks for sharing! Isn't that the way it always happens. The best shot opportunities come along when you're not ready. The Yellow Robin is a beautiful little bird. 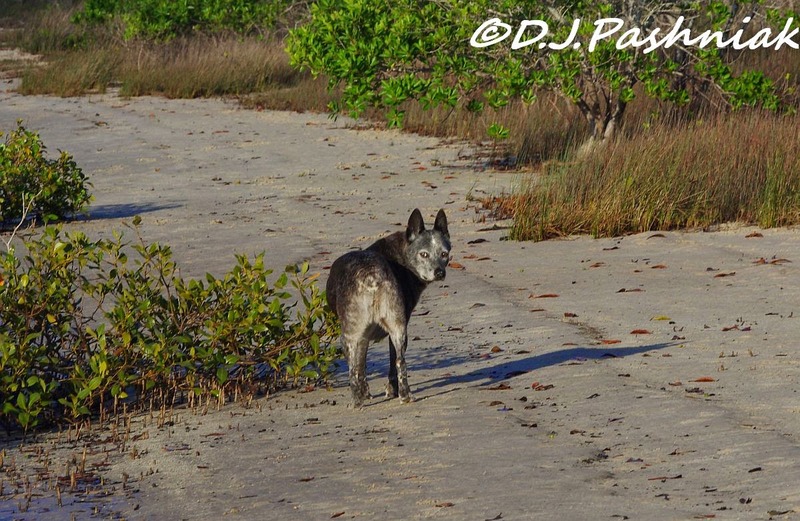 Beautiful scenic shots here and I love seeing your dog, Misty. Great ending to a morning walk! Wonderful scenery! Love the clouds and your furry buddy! The bird is just gorgeous. I'm sure glad you went for that early morning walk. Stunning scenery, Mick! I felt like I was there, breathing in the salty air and feeling the breeze on my face. Superb photos of the Yellow Robin. Thanks for sharing it all! 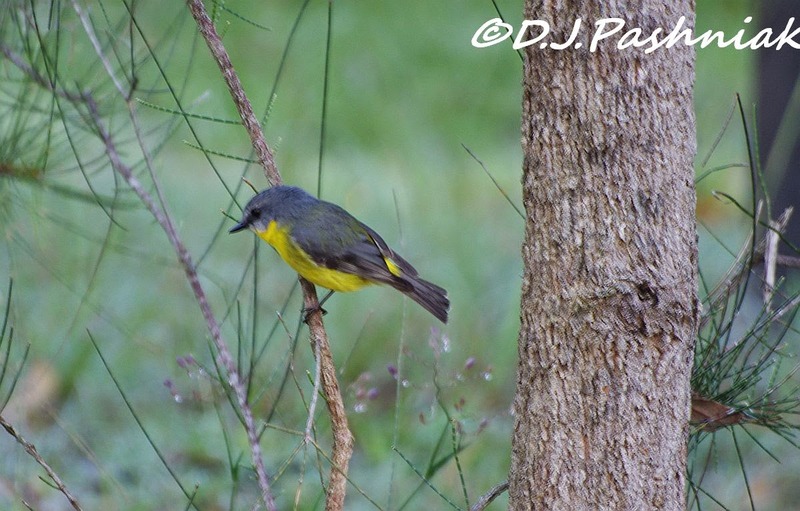 An Eastern Yellow Robin is a new one for me. I've never even seen a photo before of one. Your photographs are gorgeous! What an amazingly beautiful place!